^ Allen 2000, pp. 79–80. ^ Allen 2000, pp. 94–95. ^ Taylor 2001, p. 25. ^ David 2002, pp. 90, 94–95. ^ Fleming & Lothian 1997, p. 104. ^ David 2002, pp. 160–61. ^ Assmann 2005, pp. 209–10, 398–402. Allen, James P. Genesis in Egypt: The Philosophy of Ancient Egyptian Creation Accounts. Yale Egyptological Seminar. 1988. ISBN 0-912532-14-9. Anthes, Rudolf. Mythology in Ancient Egypt. (编) Kramer, Samuel Noah. Mythologies of the Ancient World. Anchor Books. 1961. Assmann, Jan. The Search for God in Ancient Egypt. Translated by David Lorton. Cornell University Press. 2001 . ISBN 0-8014-3786-5. Baines, John. Egyptian Myth and Discourse: Myth, Gods, and the Early Written and Iconographic Record. Journal of Near Eastern Studies. April 1991, 50 (2). JSTOR 545669. Baines, John. Myth and Literature. (编) Loprieno, Antonio. 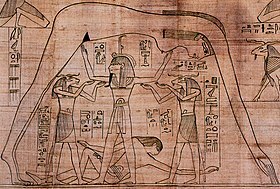 Ancient Egyptian Literature: History and Forms. Cornell University Press. 1996. ISBN 90-04-09925-5. Bickel, Susanne. Myth and Sacred Narratives: Egypt. (编) Johnston, Sarah Iles. Religions of the Ancient World: A Guide. The Belknap Press of Harvard University Press. 2004. ISBN 0-674-01517-7. Conman, Joanne. It's About Time: Ancient Egyptian Cosmology. Studien zur Altagyptischen Kultur. 2003, 31. David, Rosalie. Religion and Magic in Ancient Egypt. Penguin. 2002. ISBN 0-14-026252-0. Dunand, Françoise; Christiane Zivie-Coche. Gods and Men in Egypt: 3000 BCE to 395 CE. Translated by David Lorton. Cornell University Press. 2005 . ISBN 0-8014-8853-2. Frankfurter, David. Narrating Power: The Theory and Practice of the Magical Historiola in Ritual Spells. (编) Meyer, Marvin; Mirecki, Paul. Ancient Magic and Ritual Power. E. J. Brill. 1995. ISBN 0-8014-2550-6. Hart, George. Egyptian Myths. University of Texas Press. 1990. ISBN 0-292-72076-9. Hornung, Erik. Conceptions of God in Egypt: The One and the Many. Translated by John Baines. Cornell University Press. 1982 . ISBN 0-8014-1223-4. Hornung, Erik. Idea into Image: Essays on Ancient Egyptian Thought. Translated by Elizabeth Bredeck. Timken. 1992. ISBN 0-943221-11-0. Lesko, Leonard H. Ancient Egyptian Cosmogonies and Cosmology. (编) Shafer, Byron E. Religion in Ancient Egypt: Gods, Myths, and Personal Practice. Cornell University Press. 1991. ISBN 0-8014-2550-6. Lurker, Manfred. An Illustrated Dictionary of the Gods and Symbols of Ancient Egypt. Translated by Barbara Cummings. Thames & Hudson. 1980 . ISBN 0-500-27253-0. Meeks, Dimitri; Christine Favard-Meeks. Daily Life of the Egyptian Gods. Translated by G. M. Goshgarian. Cornell University Press. 1996 . ISBN 0-8014-8248-8. Morenz, Siegfried. Egyptian Religion. Translated by Ann E. Keep. Methuen. 1973 . ISBN 0801480299. O'Connor, David; Quirke, Stephen (编). Mysterious Lands. UCL Press. 2003. ISBN 1-84472-004-7. Pinch, Geraldine. Egyptian Mythology: A Guide to the Gods, Goddesses, and Traditions of Ancient Egypt. Oxford University Press. 2004 . ISBN 0-19-517024-5. Quirke, Stephen. The Cult of Ra: Sun Worship in Ancient Egypt. Thames and Hudson. 2001. ISBN 0-500-05107-0. Redford, Donald B. (编). The Oxford Encyclopedia of Ancient Egypt. Oxford University Press. 2001. ISBN 0-19-510234-7. Ritner, Robert Kriech. The Mechanics of Ancient Egyptian Magical Practice. The Oriental Institute of the University of Chicago. 1993. ISBN 0-918986-75-3. Tait, John (编). 'Never Had the Like Occurred': Egypt's View of Its Past. UCL Press. 2003. ISBN 1-84472-007-1. Tobin, Vincent Arieh. Theological Principles of Egyptian Religion. P. Lang. 1989. ISBN 0-8204-1082-9. Traunecker, Claude. The Gods of Egypt. Translated by David Lorton. Cornell University Press. 2001 . ISBN 0-8014-3834-9. Wilkinson, Richard H. Symbol and Magic in Egyptian Art. Thames & Hudson. 1993. ISBN 0-500-23663-1. Armour, Robert A. Gods and Myths of Ancient Egypt. The American University in Cairo Press. 2001 . ISBN 977-424-669-1. Ions, Veronica. Egyptian Mythology. Peter Bedrick Books. 1982 . ISBN 0-911745-07-6. James, T. G. H. Myths and Legends of Ancient Egypt. Grosset & Dunlap. 1971. ISBN 0-448-00866-1. Sternberg, Heike. Mythische Motive and Mythenbildung in den agyptischen Tempein und Papyri der Griechisch-Romischen Zeit. Harrassowitz. 1985. ISBN 3-447-02497-6 （德语）. Tyldesley, Joyce. Myths and Legends of Ancient Egypt. Allen Lanes. 2010. ISBN 1-84614-369-1.